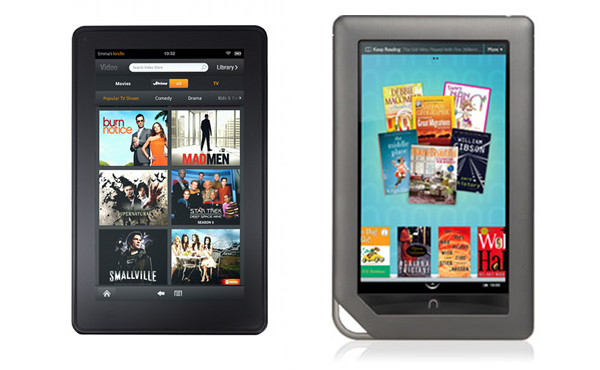 Amazon announced today the Kindle Fire, a 7-inch tablet that runs Android 2.3 Gingerbread. While many expected Amazon’s long-rumored tablet to stand as a major competitor to Apple’s iPad, the device appears to offer greater competition to the Barnes & Noble Nook Color, which is closer in specs and functionality than the far more expensive and feature-rich iPad 2. Here, a quick side-by-side comparison of the two flashiest e-readers now on the market. As you can see from the spec breakdown, the two devices are very similar. Of course, we haven’t yet had a chance to use the Kindle Fire, so there may be something lost there in its hands-on functionality, when compared to the Nook Color. But seeing as the Nook Color has a tendency to run sluggishly, by our tests at least, we hope Amazon’s newest offering won’t fall behind in the usability category. Another unknown factor is that B&N may release a new Nook Color sometime in the near future, according to recent rumors, which could shift the balance once again. But if we were to advise someone to purchase one of these two devices today, based on specs alone, the Kindle Fire appears to be the better buy. Our real advice, however, is to wait until the full verdict on the Fire is in before throwing down your credit card.